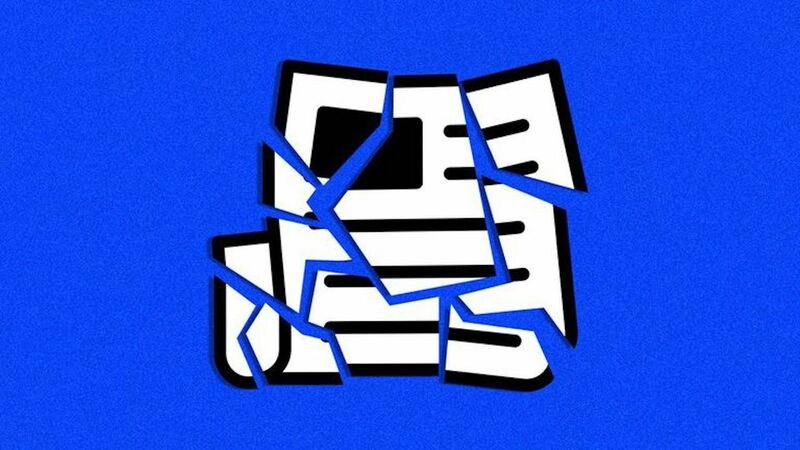 New research published in Scientific American shows that when local newspapers shutter, citizens increasingly turn to national news sources for political information — which the report says "emphasize competition and conflict between the parties." Why it matters: The findings underscore the roughly $1 billion being donated by philanthropists, corporate backers and tech companies to save local news, and puts more pressure on society to address the issue ahead of the 2020 election. Details: The study focused on split-ticket voting, a practice in which voters cast their ballot in favor of a presidential candidate from one party and a senatorial candidate from another. It found that communities that experienced a newspaper closure split their tickets less frequently than those that didn't during the presidential and senatorial elections between 2009-2012. In the absence of a strong local news source, the study points to new research that shows that people will consider partisanship a central part of their identity and put effort into expressing it. To that end, the study notes that some partisans actually sort themselves into the religious affiliation (for example, Evangelical Christians and Republicans) that matches their politics. The big picture: The study's findings are notable because they show a direct link between the rise of partisanship and local attrition. Previous reports have showed that the loss of local news can be devastating on a community — impacting everything from government operational costs to voter turnout — but have not drawn a direct correlation. Be smart: Americans are largely unaware of how bad the local news problem has gotten, according to another study from Pew Research Center. More than 70% of Americans think their local news outlets are doing very or somewhat well financially. There are dozens of efforts and lots of money being invested to find better business model solutions to support local news in America. For example, the Knight Foundation, one of the largest news non-profits in the country, announced Sunday that it's investing $6 million in 3 organizations that will focus specifically on bolstering local news business models. What's next: Until something is done, the burden is carried by most of society's major institutions. "We need to think about journalism the same way we think about supporting the arts. There's been a complete and total market failure for local news and so until the business problem is addressed, everyone — from philanthropic groups, to civic and corporate leaders, tech companies, and community leaders need to come together to address this crisis." — Jennifer Preston, Knight Foundation vice president for journalism.